In the middle of retiring the old computer upon which all of the Cyclofiend.com submissions and content resided. Which means while I wrangle the data and tame the new digital device, I need to rely upon others for content. 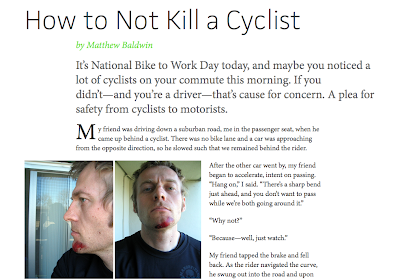 The quality of this article makes it easy - especially while Bike to Work Day is hopefully still on everyone's mind. The article is not quite as inflammatory as the headline would suggest. And please, I know that there are a ton of very oblivious cyclists out there. But, the stakes are high. Those of us who use a bicycle for daily transportation don't have the luxury of replacement body panels and a respray, should we get tapped. Clearly, there are responsibilities for all parties, and may everyone live to a ripe old age.